Agriculture, manufacturing and mining are some the largest contributors to South Dakota’s economy, creating a large demand for skilled workers. Manufacturing—from food processing to electronics—accounts for almost 10 percent of the state’s workforce. Healthcare is another significant provider of jobs in the state, with an anticipated increase of more than 7,000 new positions through 2022 to meet the growing needs of area hospitals, doctor’s offices, and nursing care facilities. Read on to find out the how a vocational and trade education can lead to career opportunities in the state’s major industries. South Dakota's trade and vocational schools are ready to help students succeed. Vocational programs can be found in community and career colleges, as well as trade schools, where students can learn the skills necessary to work in the booming healthcare and manufacturing fields. 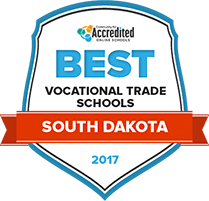 By factoring in tuition, financial aid options, student-teacher ratio and other important factors, we came up with this comprehensive ranking of South Dakota's accredited trade schools to help students make the right choice. Lake Area Technical Institute offers programs in eleven different fields including agriculture, automotive technology, computer information systems, cosmetology, dental assisting, diesel technology, electronic systems technology, energy operations, environmental technology, financial services, law enforcement, medical lab technician, nursing, precision machining, robotics, and welding technology. The school has been designated a Military Friendly School, earned a top 3 honor for the Aspen Prize for Community College Excellence in 2015, and was considered one of the “2015 Great Colleges to Work For” by The Chronicle of Higher Education. Lake Area Technical Institute’s programs are valued for their hands-on approach and the school has been recognized for having one of the best graduation rates and providing degrees that lead directly to a job; the Class of 2015 had a 99 percent placement rate. Students have the opportunity to receive dozens of vocational degrees and certifications at Southeast Technical Institute from programs in welding to patient care certifications. The school is well-known for its highly ranked horticultural certifications, associate degree programs, and its Sports Turf Management program, which will certify students to work in areas such as landscape management and golf course maintenance. Southeast Technical Institute seeks to make education accessible for everyone by offering courses in the evening, on weekends, and some programs that can be completed entirely online. This institution also boasts an impressive post-graduation employment rate of 96 percent in the six months following program completion. Consistently named one of the best community colleges in the country, the Mitchell Technical Institute offers programs in agricultural technology, health services, construction and wind turbine technology, which is an up-and-coming industry with explosive job growth. The school also offers six online degrees: everything from medical imaging to a speech language pathology assistant program. If you’re interested in health services, the Mitchell Technical Institute boasts one of the best two-year medical assistant programs in the country with an 82 percent post-graduation and job placement rate, a number well above national averages. The only technical institute to service the entirety of western South Dakota, Western Dakota Tech offers comprehensive degree, diploma, and certification programs that combine classroom learning, clinical environments and internships. WDT offers online courses, including an entirely online library technician program which offers training in library software and social media management. Perhaps most impressive about Western Dakota is their Medical Simulation Center, which offers high-tech patient simulations for health services students. The center allows for students in board-certified nursing and surgery tech programs—among others—to receive more comprehensive training. Western Dakota Technical Institute boasts high retention and high graduation rates. Students can earn vocational certificates and associate degrees through various educational institutions in South Dakota. Comprehensive high schools, trade centers, technical schools, and even four-year colleges offer certificate and degree programs in the skilled trades. Search now to find a program and school near you. According to the U.S. Department of Education, in the 2014-2015 year there were 32,149 students enrolled in career and technical education (CTE) programs in South Dakota, including 6,275 students at the post-secondary level. High school students who enroll in post-secondary courses can earn both high school and postsecondary credit for their classes. More than 95 percent of South Dakota students enrolled in CTE programs graduated in 2015. During the 2014-15 school year, 651 vocational and trade programs were offered in 151 public, nonpublic, and tribal school districts. High school students in South Dakota can opt for dual enrollment in many career and technical courses, fulfilling high school requirements even as they earn credit toward a vocational certificate. At the post-secondary level, certificates and associate degrees are offered through technical and trade schools, community colleges, and public four-year institutions. More than 75 percent of the state’s high school career and technical education graduates plan to pursue further education at the associate or bachelor’s level. While agriculture is the largest industry in the state, other areas are gaining momentum. Job openings are expanding in transportation and manufacturing, as well as in the service professions. South Dakota’s population increased by 4.8 percent between 2010 and 2014, outpacing the national rate of 3.3 percent. More people means greater demand for services, especially in healthcare and education. Nursing assistants, registered nurses, and dental hygienists can all expect optimistic growth numbers over the next several years, as can preschool teachers and teaching assistants. Below is a comparison of job openings, growth potential, and median salaries for various careers. See how career opportunities for those with vocational certificates and associate degrees compare in terms of projected job openings, growth rates and salaries. Four of South Dakota’s 10 largest employers are located in Sioux Falls, including the flooring company Shaw Industries, Sanford USD Medical Center, Citibank, and Smithfield Packaged Meats. These companies provide various job opportunities in manufacturing, healthcare, and business administration. As the state’s largest city, Sioux Falls provides students with several higher education institutions to choose from. For those interested in entering the healthcare field, two private schools offer programs focused solely on radiologic technology: Avera McKennan Hospital School of Radiologic Technology and Sanford Health Radiology School. Students interested in certificate or associate degrees in banking and financial services, healthcare coding, tourism, and business management may look into programs offered at Sioux Falls’ University Center. National American University – Sioux Falls and Globe University – Sioux Falls are private colleges offering associate degree programs in areas of study in business administration, computer science, criminal justice and social work, to name a few. Southeast Technical Institute offers diploma, certificate and associate degree programs in a number of areas, from business administration to industrial and engineering technology. Comprehensive resource for CTE students with state statistics, education delivery options, available programs of study, and financial aid information. Find the latest news related to the agriculture industry in the state, as well as job postings, resources, and events such as meetings and conferences. Information and news for current and prospective CTE students, including contact information for representatives in various parts of the state. Members gain access to networking opportunities, professional development, job postings in the state, and resources for nurses of all levels.